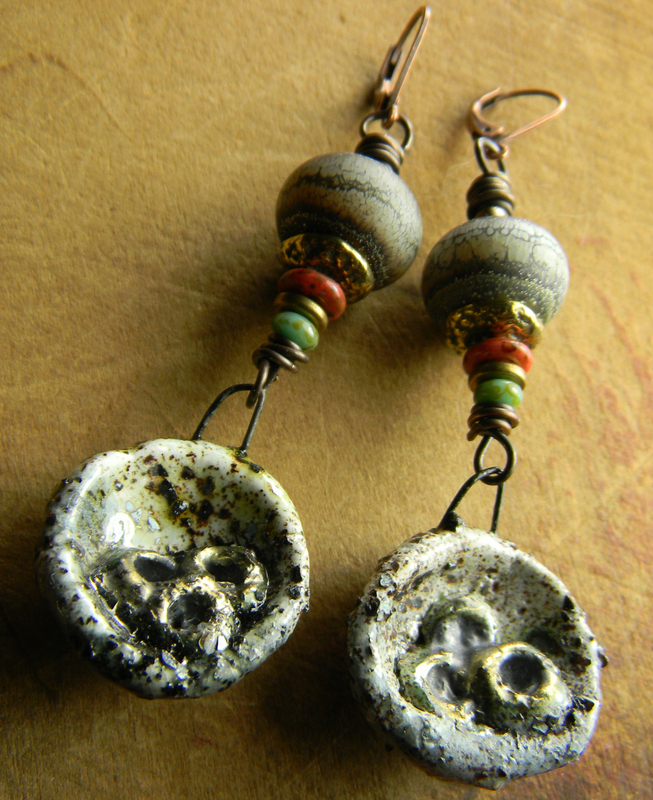 Artisan discs with an other worldly surface, porcelain in white and gray with a wash of bronze glaze over the high points, for the focal point of this boho earring design. 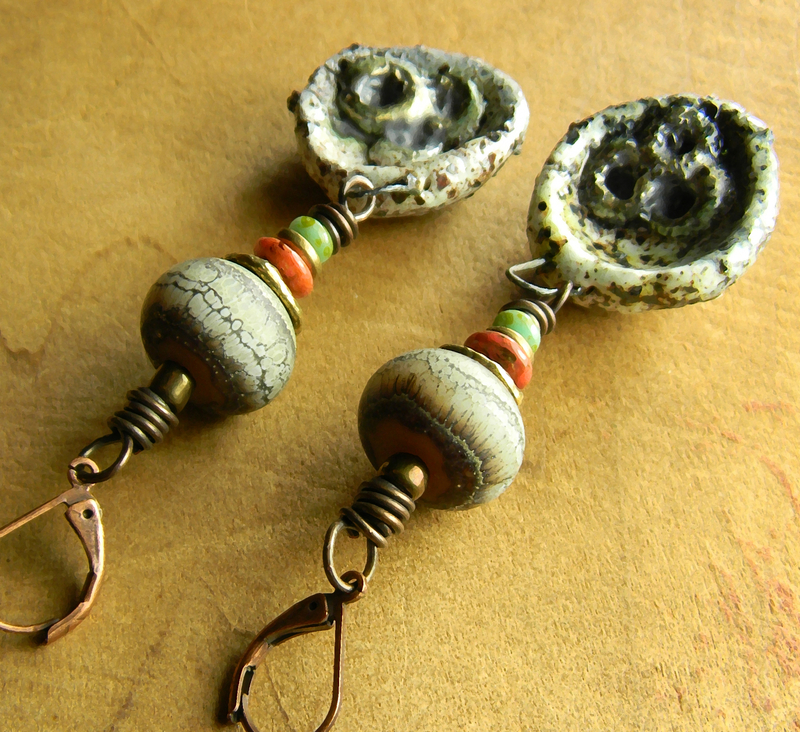 Accompanied by matte finish lampwork glass beads in similar neutral tones for a lovely boho earring design, I have added artisan bronze bead caps, bright orange and green slivers of Czech glass for color, and copper leverbacks as the finishing touch. The earrings are 3 inches in length, and as you can imagine, they do have a little weight. Porcelain barnacle drops by Petra Carpreau of Scorched Earth. Bronze bead caps by Anna Chernykh of Anna Bronze. Lampwork glass by Amber Van Meter of Naos Glass. 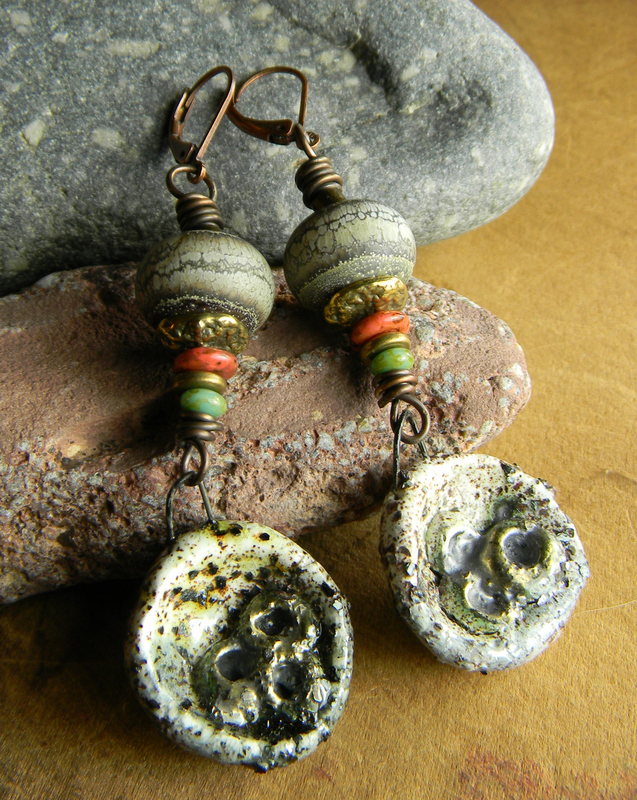 Your earrings will come gift wrapped in recycled and environmentally friendly materials. All my jewelry is 100% workmanship guaranteed. Any issues with construction or component failure within one year (under normal wear conditions) of the purchase date will be corrected at no charge to you. Take care not to wear while swimming or bathing. Please contact me if you have an issue with a purchase. I do not accept returns unless you have received a return merchandise authorization. Shipping cost is $3.50 for the first item, and .50 for each additional item in the US.